Borden's Been Making Hay ad 1993 This is an October 2, 1993 advertisement. It is a nice color ad from Borden's It pictures Elsie holding a picnic basket. 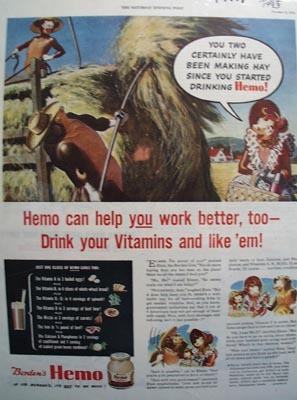 Elmer is on the hay wagon and Elsie says, You have been making hay since you started drink Hem In excellent condition. Photo is taken through plastic and may show wrinkles or crookedness that is not in the ad. This magazine tear sheet measures 10 1/2 By 13/3'4 Tall. Items Similar To "Borden's Been Making Hay ad 1993"